AMD is an age-related, degenerative problem with your retina. Age-related Macular Degeneration (AMD) occurs when the center of the retina is damaged and leads to central vision problems. The damage to the central vision results in difficulty reading, seeing fine details, and recognizing faces. It is a disease of the center of your vision and does not affect your peripheral (side) vision. AMD often affects both eyes, although one eye may be affected more than the other. Disease severity can vary considerably as some people with the disease may not notice any changes at all. Severe cases may permanently damage the central vision causing things to appear distorted or missing. When reading, the letters might be distorted or crooked, or a dark spot in the center of your vision may hide letters. AMD is very common in people over the age of 60 and is a leading cause of vision loss in this age group. About 85% of patients with AMD suffer from the dry type of Macular Degeneration, where the central vision becomes blurred. Although Wet AMD affects only 10-15% of patients with this condition, it means 90% of severe vision loss, making daily activities a challenge. This form of age-related Macular Degeneration is the most common. Dry AMD makes up about 90% (9 out of 10) of the cases of AMD. Dry AMD is when age-related deposits form under the retina (deposits are called drusen). Dry AMD can also result in thinning of the central retina. Dry AMD can cause central vision loss, but this is usually a slow process. At this time, there are no treatments for dry AMD. Specially formulated vitamins for the eye can decrease the risk of progressing to the most advanced forms of AMD. 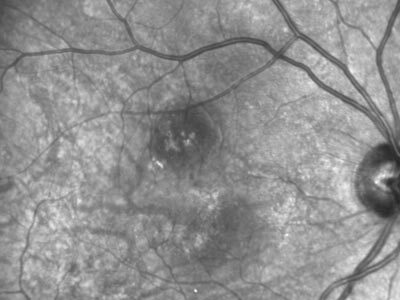 Image shows evidence of dry AMD. This form of age-related Macular Degeneration is less common, but is more serious. Wet AMD is when new, abnormal blood vessels grow underneath the retina like weeds growing through cracks in a sidewalk. The blood vessels bleed, leak fluid, and form scar tissue that causes damage to the central vision. 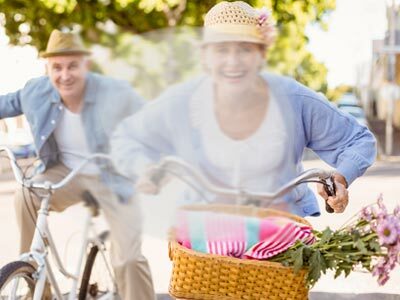 Wet AMD progresses much faster than dry AMD, but if caught early, treatments are available to stabilize the vision and decrease the risk of losing more vision. Image shows evidence of wet AMD. Regular eye exams and home monitoring allow for early diagnosis and treatment. 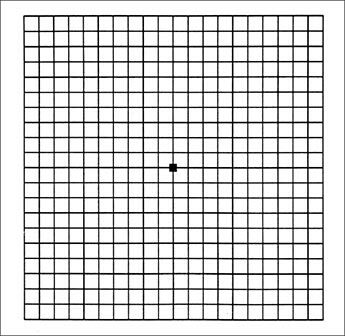 Images showing the Amsler Grid and how it might appear to someone with age-related Macular Degeneration. Watch how the Doctor explains new technology, a home vision monitoring app for patients with AMD and Diabetes, that alerts her Doctor of vision change. Heart disease and having high cholesterol levels are also risk factors for AMD. AMD is diagnosed by an exam by your eye doctor which will include special tests. Your ophthalmologist will put drops in your eye to dilate (widen) your pupil. This allows your eye doctor to look through a special lens at the inside of your eye to evaluate the retina. 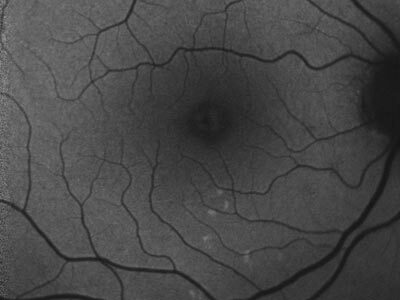 Additional testing includes, Optical Coherence Tomography (OCT) and Fluorescein Angiography. 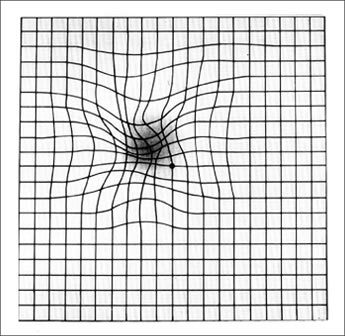 Optical coherence tomography (OCT) is a way to non-invasively look closely at the retina. A machine scans the retina and provides very detailed images of the retina and macula, similar to an Ultrasound. Fluorescein Angiography (FA) is a special picture that uses a yellow dye (called fluorescein) that is injected into a vein, usually in your arm. A special camera takes photos of the retina as the dye travels throughout its blood vessels to identify any abnormal new blood vessels growing under the retina. Dry AMD: At this time, there are no proven treatments for dry AMD. However, people with lots of drusen or serious vision loss might benefit from nutritional supplements. Specially formulated supplements may benefit people with dry AMD. AREDS 2 (Age-Related Eye Disease Study 2) was a large research study that looked at taking vitamins and minerals daily for AMD. The AREDS2 study found that certain nutritional supplements could decrease the risk of developing the advanced forms of AMD. These supplements may also be beneficial to people who have lost vision in one eye from AMD. Although nutritional supplements may be beneficial in people with AMD, they are not a cure. Your ophthalmologist can tell you if vitamins and minerals are recommended for your dry AMD. 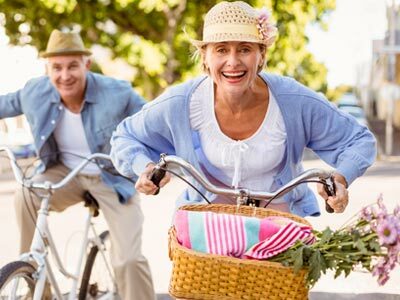 In addition to vitamin supplements, a well-balanced diet with dark, green leafy vegetables and colorful fruits and vegetables are beneficial to people with AMD. Wet AMD: Wet AMD is treated with medications called Anti-VEGF drugs. Anti-VEGF stands for anti vascular endothelial growth factor. These drugs work by stopping a protein called vascular endothelial growth factor (VEGF) produced by cells in the retina from working. New blood vessel growth is a major problem which occurs in a number of eye conditions. Anti-VEGF treatment helps shrink the abnormal blood vessels in your retina and decrease the bleeding and leaking of fluid from these vessels. At this time, the only way to give these medications is with an injection into the white part of your eye. Wet AMD is a chronic disease that requires ongoing treatment to decrease further vision loss. Treatment is individualized to each person, but most people need long-term treatment. If you have central vision loss from AMD, you can learn to maximize the remaining part of your vision. Special low vision tools, such as magnifiers, handheld computers, electronic items and more can help you perform your usual daily tasks. Additionally, since you keep your peripheral (side) vision, you can learn to use this side vision to do things. Ask your ophthalmologist to help you find a vision rehabilitation (or low vision) specialist in your area. There are many tools to help you maintain as much independence as possible. is an age-related degenerative disease of the retina. AMD can result in loss of your central vision while maintaining your peripheral (side) vision. AMD comes in two forms: dry and wet. At this time, there are no proven treatments for dry AMD. 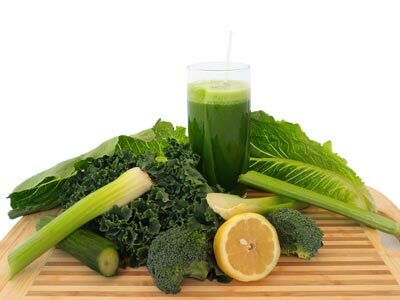 Certain vitamins and minerals can decrease the risk of progressing to advanced forms of the disease. Wet AMD is treated with injections of anti-VEGF medications into the eye. Frequent visits with your eye care specialist and home monitoring of your vision is the best way to identify AMD early.